MPG is a file extension for MPEG-1 and MPEG-2 video and audio compression. But you may find yourself frustrating when you play MPG files on QuickTime, though MPEG-2 is added into QuickTime supported list. For example, you may get an error message saying "This is not a movie file" when you play a file with the extension .mpg, the QuickTime player crashes or you have some problem with the audio for any .mpg files on your Macbook Pro. So converting MPG to MOV video format is a must have in order to have a smooth .mpg playback on QT. 1. Enjoy conversion among 180+ formats, like MPG to MOV, MP4, MKV, etc. 2. Edit MPG before converting to MOV, such as trim/crop/cut/rotate, etc. 3. Download and record online videos from YouTube, Facebook, Vimeo, etc. 4. One-click transfer MPG or MOV to iPhone, iPad, with 400+ device profiles. 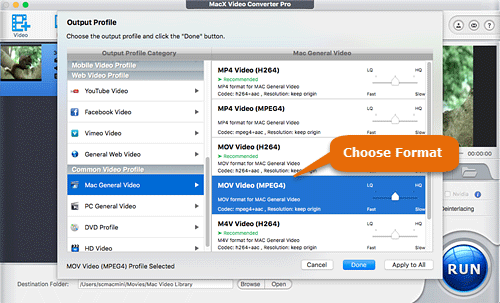 If you are one of users of Mac and other Apple products who cannot play MPG or other incompatible file formats like AVI, WMV, MKV, MTS, etc, you can take a try of MacX Video Converter Pro, which can tackle the codec issues and makes MPG to MOV conversion a fraction of seconds. With 370+ audio and video codecs, you can change MPG format or any other Mac-incompatible formats into QuickTime reliable formats MOV, M4V, MP4 with almost no quality loss. The MPG to MOV converter is at your service in case you are longing for a one click to convert MOG to d any other Apple devices, thanks to its preset device profiles tailored to iPhone, iPad, iTunes, Apple TV and even Android mobiles. Follow the steps below to convert MPG to MOV for QuickTime or other iDevices.This converter is also applicable to AVI, WMV, or other non-Mac compatible formats. See how to fix the error when AVI won't play on QuickTime. Free download the MPG to MOV converter on your Mac (iMac, Macbook Pro/Air, Mac Mini), add MPG file by click +Video button the main interface of the software. Batch conversion is well supported. So you can add many MPG files at a time. 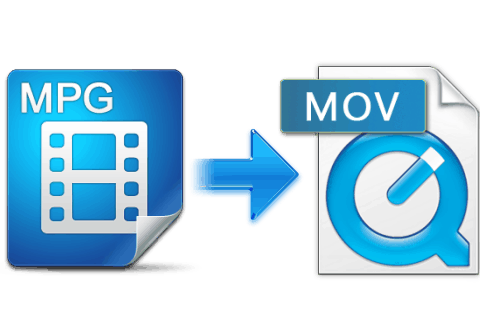 To transfer MPG to MOV format on Mac, simply go to Mac General Profile > choose MOV (MPEG4, H.264) as the output format. Click Browse button to save the output MOV file and press RUN to begin the video conversion from MPG to MOV format on your Mac. Note 1: You can adjust the slide bar to the rightmost for the highest possible quality or put it to the leftmost for the fastest conversion speed. Note 2: Click the cogwheel-shaped button on the main interface, where you can tweak the parameter settings, such as change aspect ratio, lower video resolution from 4k to 1080p to reduce file size, higher the bit rate for best quality, and more. Note 3: Press the Edit button on the main interface, which allows you to crop your favorite part of the MPG video, cut off the black bars, and even add subtitles to MPG before converting to MOV. Note 4: Check the Hardware Encoder box to accelerating the MPG to MOV conversion maximally. It is tested 5x faster compared with other MPG to MOV converters. In addition to the video converter you can also use the online service like Zamzarr to do the MPG to MOV conversion. It's totally free and you don't have to download or install anything at all. Here are the steps to convert MPG video to MOV format online. Step 1: Choose MPG file you'd like to convert to. Step 2: Choose MOV as the target format. Step 3: Valid email address is required to receive the converted MOV file. Step 4: Click Convert button. It will take some time to convert MPG to MOV, depending on the internet connection speed. 400+ device profiles, including iPhone 7, iPad Pro, Samsung Galaxy S8, etc. 1. Fast MPG to MOV video conversion speed. 4. Tweak video/audio parameter settings. 1. Straightforward and easy to use. 2. No need to install any software. 1. Email address is required. 2. MPG to MOV conversion is lengthy. 3. Internet connection is required. 4. File size is limited to 100mb maximally. What is MPG: MPG file is a common video file using a digital video format standardized by MPEG. It is often distributed on the internet and incorporates MPEG1 and MPEG2 audio and video compression. What is MOV: MOV is a default file format used natively by the QuickTime framework, containing one or more tracks for storing data such as audio, video, subtitles, etc. MacX Video Converter Pro is built in 370+ video/audio codecs and can transcode between HD and SD videos like convert MPG to MOV, AVCHD MTS to MP4, Blu-ray to MKV, AVI to MOV, etc. It's embedded with 400+ profiles tailored to iPhone, iPad, Android, Microsoft, Sony PSP, etc.